I admit it, even a famous restaurant blogger like myself is not quite ready to shell out 1000€ for a dinner for two in Paris, or anywhere else for that matter. Just how good can food be? Well, until I’m ready to splurge, the answer to that question will have to wait, but I’m pretty sure it’s along the lines of ‘pretty damn good.’ Or, as Larry David would put it, ‘pretty, pretty, good.’ Or, according to Alexandro Lobrano, it is equivalent to 'an experience of gastronomic luxury that's as solidly engineered as a Mercedes and as consensually tasteful as a string of good pearls.' That good. 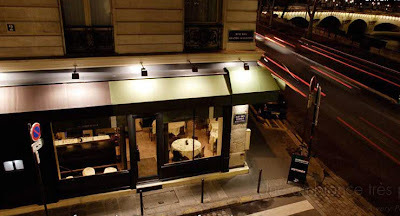 This by way of introduction to a Friday night dinner at Guy Savoy’s ‘baby bistro,’ Les Bouquinistes, Guy Savoy’s affordable alternative, ideally located in the heart of the Latin Quarter. 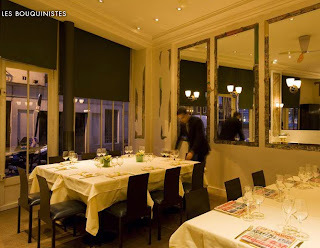 If you opt for the bottom of the barrel at Restaurant Guy Savoy, i.e., the 275€ menu, forget about the espresso at the end of the meal, and carefully select a bottle of wine under a couple hundred euros, a couple can probably get away with a final tally suitably under the century mark. An alternative is to splurge at Les Bouquinistes and still end up at around one-fourth what an outing at the more famous eating establishment would run. But all this talk about money – this blog is about food, so let’s get to it. When I say Les Bouquinistes is ideally located, I'm not exaggerating. Parking garage a couple short blocks away, the Seine right across the street. To your right, Notre Dame; to your left, the Pont Neuf. 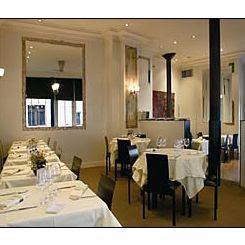 And two doors up the street, Ze Kitchen Galerie, my clear favorite of the two competing restaurants. In fact, this is a mecca for gastronomic restaurants - there are several worthy of attention in the immediate area. We opted for a corner table on the far side in the back, which seemed to perplex our host, who suggested that I was sitting in the 'girl's seat' against the wall. How could he know that I am an avid proponent of flipping gender conventions on their head. Co. was immediately taken by the 75€ menu dégustation 'Les Bouquinistes' and who was I to argue? Here's how it unrolled, following an obligatory mis-en-bouche, which consisted of a tasty cold fish soup with a dollop of cream on top. First course: Ballottine de foie gras au sel de Guérande. I'm probably one of the few people on the planet who isn't gaga over foie gras and this dish didn't change my mind. To wit, three round two-euro-sized pieces of foie gras, two dark purple cherries, and some greens, served with a plate of toast strips. Co. was a bit disappointed with the foie gras per se, but I had to agree with her assessment that the cherries provided a perfect counterpoint to the dish. Smashing a piece of cherry on the toast and then laying on top a slab of foie gras almost had me convinced that it is time to reassess my attitude towards the French delicacy. Almost. Second course: Homard et tourteau en fine raviole de betterave. On paper, this promised to be the killer dish. In reality, major disappointment. If you intend to imbibe in the menu degustation, remember to bring your microscope. I could have used one to locate the miniscule piece of lobster and artichoke. The minced crab was sweet and succulent, but not much easier to locate than the aforementioned components. Even the betterave - year of the beet! - was so thinly sliced, I could barely taste it. Move on. Third course: Dorade royale en écailles de courgettes. This was probably my favorite course. 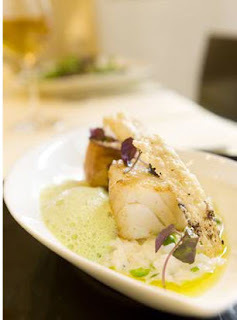 The dorade fish was cooked croustillant and enveloped by a layer of small slices of zucchini. Fourth course: Crème de céleri, royale de foie gras et asperges. Our waiter informed us that this dish is the one that typically earns the most accolades, and I get it. This was a silky and luscious soup, served with slices of asparagus, foie gras as smooth as mashed potatoes. This was very tasty, but I still give the edge to the dorade. Fifth course: Filet de veau rôti, légumes au thym. I don't eat veal, but the staff was flexible enough to swap that dish for me with fish, this time noisettes de cabillaud à la coriandre fraîche et légumes. The veal turned out to be a peak experience for Co., perfectly cooked in a red wine sauce with large slices of onion, peas and carrots, and lemon confit. For my part, there was nothing special about the cabillaud. Diligently eaten, quickly forgotten. Sixth course: Dessert. Chocolate - menthe. This looked unexceptional - a sizable piece of thinly sliced chocolate with some cream and dollops of mint. Both of us concurred that this was pretty, pretty nice. Definitely a highlight. There you have it - six courses, one meal, 150 euros accompanied by a very good 40€ bottle of red Jura - Arbois 2002 Domaine de Pinte, bringing the total, with one coffee to 194€. As with these sorts of menu degustations, the dishes can be small, or in the case of the lobster, veritably subliminal, but with six courses and some bread thrown in, you're not going to go home hungry. Instead, I went home pissed (American style, not Brit style). Let me elaborate. Despite online comments, we found the waitstaff, a contingent of young, personable guys, rather, well, personable. One waiter took pride in guessing our perfumes. Right on the money, always important to have a skill to fall back on. But when the bill came, there it was - again - the incorrect charge for the wine. Ten euros in their favor. I've already commented on this tendency in nicely located Parisian restaurants when the waiter catches some of our English conversation. Clearly, a restaurant with Les Bouquinistes' reputation doesn't have to rip off their patrons by overcharging 10€ for the wine. That would be just out and out stupid. When I pointed out the error, there was a frantic escape to retrieve a wine list and then the resulting excuse - the white Jura is 50€, a simple mistake. I'm so sure. Whether this little miscue was intentional or not, it has no place in a Guy Savoy restaurant, baby bistro or big Daddy. So I could have titled this installment, 'How to Save 700 Euros + 10 Euros if you are vigilant enough. Outside on the doorstep, I pulled out a 10€ note and tore it up into tiny little pieces - if they want to find them all, they'll need that microscope. Hi, I enjoy the blog. Write up something on my friend at the Cochon à l'oreille on Rue Montmartre. And I imgine it's typo, but tourteau ain't turtle...though that would be a dish worth trying. Thanks for the suggestion. Apologies for the tourteau faux pas. I stand corrected. Comparing GS to LB is like comparing Paris to Montreal. They are both cities and they are both francophone, mais rien à voir. LB is a meal. GS is an experience. Try their 100Euro lunch special. It is a revelation.